Detail, painting by Jacques Louis David. 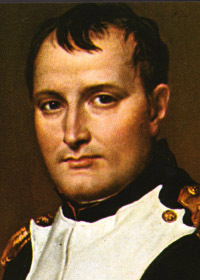 Born Napoleone Buonaparte in Corsica and trained in military schools in Paris, Napoleon was promoted to general after the seige of Toulon in 1793. He lead troops into most of Europe and, in 1798, Egypt. Returning to France, he was nominated first Consul after the revolution of 18th Brumaire. Napoleon founded the Bank of France, reformed the tax system, restored the church, improved the education system and in 1804 assumed the hereditary title of emperor of the French. The following year he was at war with Russia, Austria and England. By April 1814 he was forced to abdicate and exiled to Elba. He attempted to regain his empire in 1815 but was defeated at Waterloo. Banished to St. Helena, he died six years later. His masonic affiliation is not universally agreed. Napoleon appointed his brothers to masonic office: [l to r] Louis (1778/08/02 - 1846/07/25) was named Deputy Grand Master in 1805; Jerome (1784/11/15 - 1860/06/24) was Grand Master of the Grand Orient Westphalia; the eldest, Joseph (1768/01/07- 1844/07/28), was made a freemason at the Tuilleries in April of 1805, and appointed Grand Master of the Grand Orient of France; and Lucien (1775/05/21 - 1840/06/29) was a member of the Grand Orient of France. Source: Ars Quatur Coronatorum vol. xxvii (1914) and Denslow. Cf. : AQC vol viii (1895) pp. 188-89; argues against Napoleons initiation.